Mouth odour is something we are really conscious about in a public space. Eating in a party or workplace becomes a concern, as some foods leave their smell behind. Good oral hygiene is the key to fight bad breath. If you don’t brush your teeth daily, food particles will remain in your mouth, causing bacteria to grow between teeth, around the gums, and on the tongue. This leads to bad breath. TabletShablet brings to you an instant and best solution for your mouth odour, Freshmeltz Oral Hygiene strips. It is a product of Inventz from the house of Delvin Formulations, an innovative formulation, which provides instant freshness in the mouth. Experience instant fresh breath confidence with uniquely formulated fresh breath strips. FreshMeltz has active anti-bacterial properties that provide you with oral hygiene all day. Poor oral health extends far beyond your mouth, taking a serious toll on an individual’s overall health and well-being. Is Brushing your teeth every morning and night doesn’t give you a fresh and clean breath? Even a regular oral hygiene routine could be leaving gaps and does not provide around the clock protection. Freshmeltz is India’s first mouth freshener and fresh breath strips, with an insta-melt property. Keep a strip of Freshmeltz on your tongue, allow it to melt and get a feel of ‘Instant Freshness’. It kills the bacteria that create a bad odour in your mouth leaving behind a clean and fresh breath. We aim at nourishing the world by providing the best oral care products, at the comfort of your home. FreshmeltzOral Hygiene strips is an instant-melt breath freshener and Cleanser. These Fresh breath strips are sugar-free, can be used by diabetics. FreshMeltz kills bacteria in the mouth, thus keeping our mouth clean. It provides Fresh and clean breath- Anytime Anywhere. Most of the brands in the market just provide mouth flavour, not freshness. But none kills the bacteria. Comes in a convenient, easy to carry, pocket-size pouch. 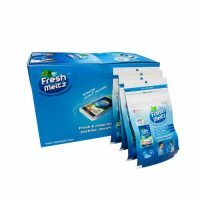 Freshmeltz comes in an exciting pack of 15 sugar-free, fresh breath strips. Use Freshmeltz to keep your mouth fresh & clean, after eating food or before speaking. Don’t use more than 3 strips at a time. Keep out of the reach of children. Read the label carefully before use.